The Platform System and Loft provide your cat with the perfect perch to relax on. In addition to the 12″ inch high platform with two decks, your cat will enjoy an additional loft deck. This will give your feline friend plenty of room to enjoy along with a favorite new vantage point. The Platform System and Loft provides your cat with the perfect perch to relax on. In addition to the 12″ inch high platform with two decks (front deck 23″w x 8″d, rear deck 23″w x 5.5″d), your cat will enjoy an additional loft deck, which measures 23″w x 34″d. The whole system is supported by 3″x3″ treated posts that will resist wind, rot, and warping. This will give your feline friend plenty of room to enjoy along with a favorite new vantage point. Both the platform and loft come completely assembled. 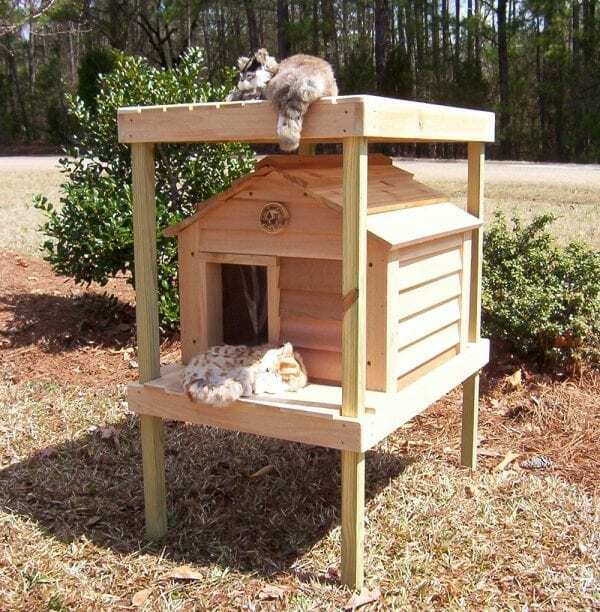 Simply insert legs into platform, insert screws, set in the small cedar cat house and attach the loft on top (36″ above ground).